← 11/29/12 – Sharon Shannon – The Galway Girl! 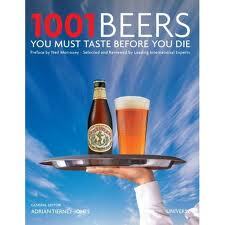 Amongst all the lovely presents I got for Christmas was a book by Adrian Tierney-Jones called 1001 Beers You Must Taste Before You Die. The title itself I took as a challenge, so the mission to tick off all the beers in the book will begin in earnest later today! In the interests of my personal well being, I won’t be tackling the beers on a daily basis, I value my liver too much, but as one a week will take nearly 20 years, I’ll be checking in more than once a week! I’ve also set up a Facebook page, called The Ale Trail, on which I’ll post random updates. Needless to say I’ll be coming across beers that aren’t in the book, so I’ll be posting about those too! Anyway, here’s a photo of the book in question and until I’ve tasted the first of the 1001 drinks it just leaves me to say Cheers!